We are a global campaign to center the knowledge of marginalized communities (the majority of the world) on the internet. 3/4 of the online population of the world today comes from the global South – from Asia, from Africa, from Latin America. And nearly half those online are women. Yet most public knowledge online has so far been written by white men from Europe and North America. To address this, we work particularly with women, people of color, LGBTQI communities, indigenous peoples and others from the global South to build and represent more of all of our own knowledge online. 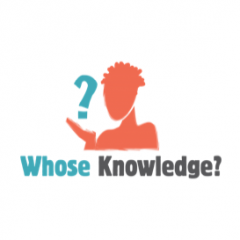 Whose Knowledge? is a radical re-imagining and reconstruction of the internet, so that together we build and defend an internet of, for and by all.